Big news, Team. Actually technically it’s little news, but you catch my drift. I’m adding to the Lazy Girl Fitness team, with a baby boy, due in December! Now you may be thinking to yourself, ‘wow, December, that’s not far away!’. Trust me when I tell you that noone is thinking that more than me. That’s why you might have noticed that I’ve been a little AWOL over the last few months – I’ve been running around like a mad person, trying to get things in order before this little human comes into the world. Part of that madness has included a pre and post-natal personal training course, so I a) know a little more about what’s happening with my own body and b) can share advice on what has and hasn’t worked for me plus potentially even c) some mums and bubs training down the track (hit me up here if you’d be interested in learning more about this). Karn and I couldn’t be more excited to meet the little guy, and I look forward to sharing more about this crazy ride. 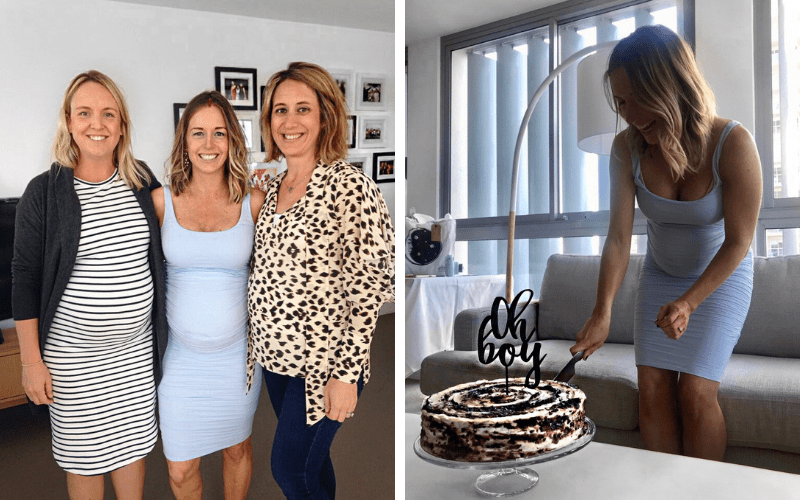 My plan it to keep sharing lots of the LGF signature workouts, recipes and tips that you’ve come to know (and love…) and add in some mum-related fitness and lifestyle tips and tricks that I learn along the way. After all, I’ve always said that life is about balance, right?! p.s two of my most favourite people are due within a month of me. That’s my two bridesmaids top left with me – how lucky am I??? p.p.s pics are from my baby shower last weekend, and they’re close to the first bump pics I’ve put in the public domain! Stay tuned for more along the way though. Congrats! Love to know which pre and post natal course you chose to study? Thank you! I did one through a woman called Claire Norgate – found it a great starting point. Happy to share/answer any questions if you want to drop me an email!